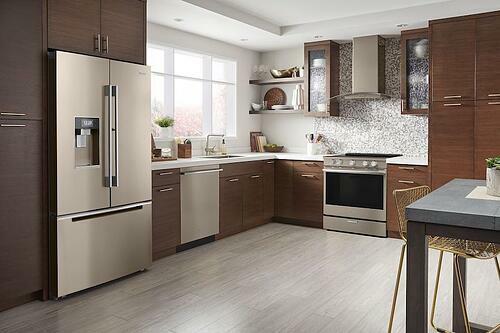 After years of stainless steel being the go-to premium finish for kitchens across the country, manufacturers have started to offer new appliance colors to the market. GE began offering slate and then black slate to compete with new black stainless steel (all of which you can learn about and compare in our article on the topic). GE began offering slate appliances in 2012-2013, and as of 2018, most major appliance manufacturers offer black stainless steel appliances. If you want to learn more about the differences in black stainless steel stylings from a variety of brands, check out our article comparing new appliance colors! But you're here to learn about a new color option from Whirlpool: Sunset Bronze. They've been teasing us with this new color for a couple of years, but have finally started offering it to the public in 2018. As of mid-2018, there is nothing else quite like it on the market! Let's dig in! This appliance color is hard to describe in words alone - so we've also got a video below to show off this dazzling new style. But the basic look of Sunset Bronze is a warm pale gold that can look like copper or rose gold depending on the lighting. It is smudge-proof and has a satin finish, maintaining the metallic texture of stainless steel. Check Out This Video For A Live Look! This is a truly unique finish that is even warmer in tone than GE Slate, so it is almost the polar opposite of stainless steel. They achieve the tone by layering the sunset bronze color over stainless steel, so it retains the brushed metallic look of the stainless steel but with a warmer, softer affect that's super fingerprint-resistant. Click here to explore the full lineup of Whirlpool Sunset Bronze Appliances currently available, or learn more about their new low profile microwaves here! Whirlpool added the Sunset Bronze option to some of its existing appliances, so you can build an entire kitchen appliance suite in Sunset Bronze and also review the performance and customer response to these appliances rather than dealing with models that are in a new color and are totally untested on the market. This is an even warmer tone than GE's slate color, so if you want to add a welcoming, luxe glow to your kitchen, Sunset Bronze might be perfect for you. Whirlpool claims that sunset bronze has been tested to be just as tough as stainless steel, whether it's on a refrigerator or a range. Whirlpool has released a full suite of Sunset Bronze appliances, so you can easily remodel your entire kitchen in this new color! Sunset Bronze matches well with light colors, natural woods, and earthy tones, but could also work well with black cabinetry. This color is currently highly unique when other popular new colors like black stainless steel and GE slate are still keeping towards silvery metals in cool tones. As with any new appliance color, Sunset Bronze is relatively untested on the market, so potential issues like chipping or peeling could show up down the road that will then need to be addressed by the manufacturer. Like GE Slate, your kitchen will look its best with an entire suite of Sunset Bronze appliances, so replacing your appliances one by one may not look very cohesive. If you have cool gray cabinetry, this color may not work for your kitchen. 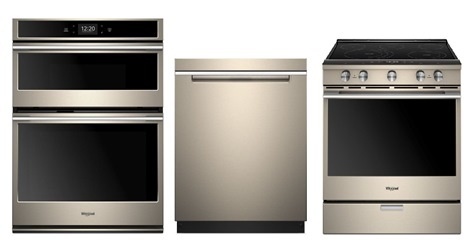 Only select models are currently available in Sunset Bronze, so your choices for a new kitchen suite are limited. 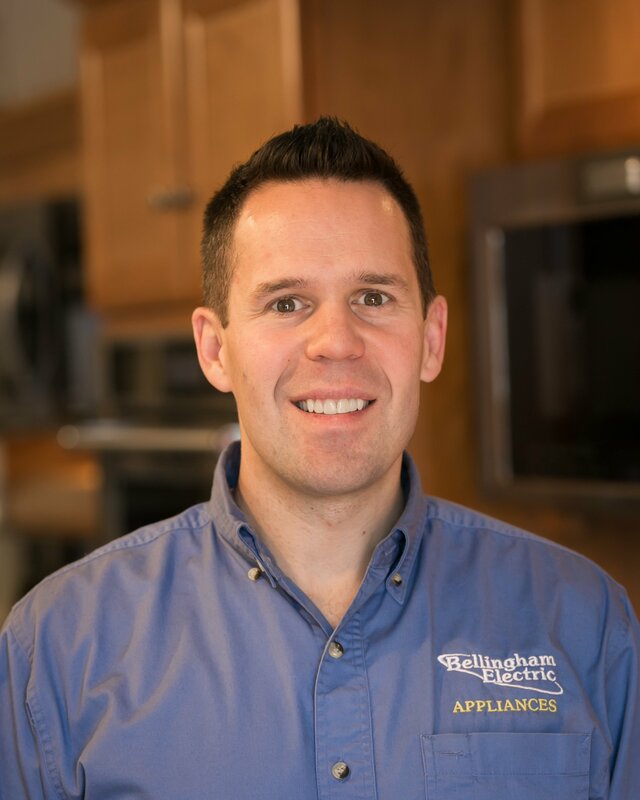 Appliance manufacturers are experimenting with alternatives to the classic stainless steel, but there have been failures along the way - if you are a trend-savvy appliance buyer, you may remember the Jenn Air oiled bronze color from the early 2000s, which didn't last long. It's too early to tell yet if Whirlpool Sunset Bronze will prevail or not. We haven't seen many sales of Sunset Bronze appliance suites in our store, but that doesn't necessarily indicate a national trend. If you are sick to death of stainless steel, sunset bronze may be the perfect alternative! However, if you are concerned about whether the color will last or be discontinued, you may want to consider GE slate, since it has proven to be popular on the market and offers a warmer, stone-inspired finish compared to stainless steel. Whirlpool is taking a bold step in appliance aesthetics. If you want your kitchen to be truly unique, this color is definitely a must-see. Although it may not be as crazy as the pinks, yellows, and blues of the 50s and 60s, Sunset Bronze marches to the beat of a different drummer. What do you think about Sunset Bronze? Would you want it in your kitchen? Let us know - We'd love to hear from you! Editor's Note: This blog was originally written in October of 2018 and has been completely revamped and updated for accuracy as of the publication date noted above.